The closing of the Rikers Island Correction Facility will also close an ignominious chapter in the City’s correctional facility history. With the Borough-based Jail System, the Municipal Art Society of New York (MAS) believes the City has taken an important step in improving New York City’s justice system. The City’s commitment to build new jail facilities closer to associated courts will be a tremendous benefit for detainees, their families, and visitors. As progressive the effort is to create a smaller, safer, and more equitable criminal justice system, it poses an extremely complex planning challenge for the City to both achieve the project’s goals and effectively integrate the new facilities into four neighborhoods. Accordingly, we have many recommendations regarding the planning, site selection, and public outreach that need to be properly addressed before we can fully support the project. 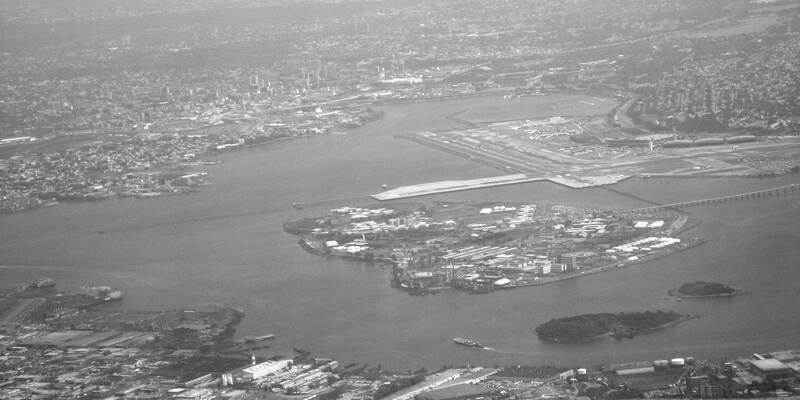 An aerial view of Riker's Island. Photo: Wikimedia Commons, Cdogsimmons. Modifications: photo cropped and transformed to black and white. Despite the scale of the new facilities and the sensitivity of the corrections issue, we find availability of detailed information about the facility site selection process to be largely deficient. Equally lacking are details about facility design and construction. We also have concerns about the four Neighborhood Advisory Councils (NACs), tasked by the City to glean input from the respective communities for each facility. These NACs must operate with the greatest transparency possible. The Department of Correction’s (DOC) borough-based jail system involves the construction of four new detention facilities in the Bronx, Brooklyn, Manhattan, and Queens. The stated primary goal is to create modern facilities and reduce the city’s jail population to a maximum of 5,000 people. To facilitate this, DOC is seeking the approval of a series of land use actions including special permits and zoning map and text amendments. All four facilities are proposed to contain 1,437 beds, support services, and community or retail space. The Bronx and Manhattan sites will include court-related facilities, and the Queens site would provide centralized care services. The City also seeks to rezone a portion of the Bronx site to establish a Special Mixed-Use M1-4/R7-X district with 235 affordable housing units. The Bronx, Brooklyn, Manhattan, and Queens facilities would be built at a maximum height of 245, 395, 450, and 270 feet, respectively. Since the release of the Draft Scope of Work, the City has responded to community concerns by relocating the proposed Manhattan facility from the historic Louis J. Lefkowitz building (80 Centre Street) to the existing jail at 124-125 White Street. According to the project Draft Environmental Impact Statement (DEIS), the first site selection criterion for the new jail facilities is close proximity to courthouses, which three of the four proposed sites achieve. However, with the Bronx Criminal Court 1.5 miles from the proposed Bronx facility, the siting fails to meet the stated purpose of the project. During the project scoping period, MAS requested an evaluation of alternative Bronx sites closer to the courts. This information has not been provided in the DEIS or other project documentation. Therefore, for purpose of much improved transparency, the City must make available the site selection evaluations, including a list of all sites considered for the four locations and the criteria used to eliminate sites from consideration. We also request clarification on whether the Bronx facility will be the sole location for parole and bail operations for all detainees across all four sites. The City must provide a thorough rationale for establishing a Special Mixed-Use District on a portion of the Bronx jail site within the Port Morris Industrial Business Zone. The new Special District, which would cover the western portion of the existing NYPD Bronx Tow Pound, would have a residential FAR higher than the neighboring R6 and R7-1 districts and introduce 235 dwelling units to a predominantly industrial neighborhood. MAS finds the renderings of the proposed facilities in the DEIS and other project information woefully insufficient, as they fail to depict the full extent of the proposed jails within their respective surroundings. This is of particular importance given that neighborhood integration is a guiding urban design principle for the project. For facilities of this size, we expect that clear, full-scale renderings, massing studies, and other visual representations be provided for public review. In addition, the facilities in each location should be scaled to the likely populations from each borough. We urge the Mayor’s office and DOC to publicly release a plan for the combined 3,000 plus beds at the Brooklyn and Manhattan sites that will be temporarily displaced during the seven-year construction process. Details are needed on where inmates will be housed in the interim, how they will be transported between borough courts, and how capacity will be managed. MAS believes that closing the Rikers Island Correctional Facility and opening new borough-based jails is a forward-thinking initiative that will overhaul the City’s justice system. If successful, the project will provide a more modern, convenient, and humane detention system and reduce the overall jail population. New York City has an opportunity to emerge as a national leader in creating equitable detention facilities. However, this is an extremely challenging and complex project. The CEQR process should begin to correct for many of the deficiencies in the process to date. Mindful of the magnitude of the proposed facilities and the sensitive nature of corrections operations in city neighborhoods, careful consideration must be made by the City regarding project planning, information about site selection and design, and effective and transparent community engagement.